No LEDs on this precision instrument! 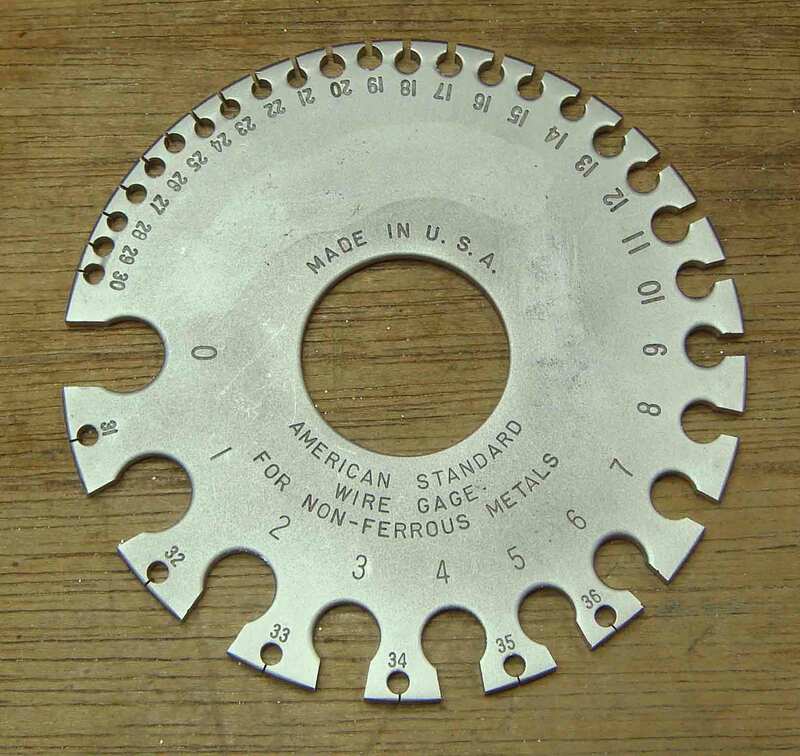 AWG (American Wire Gauge) … this will be important later…. 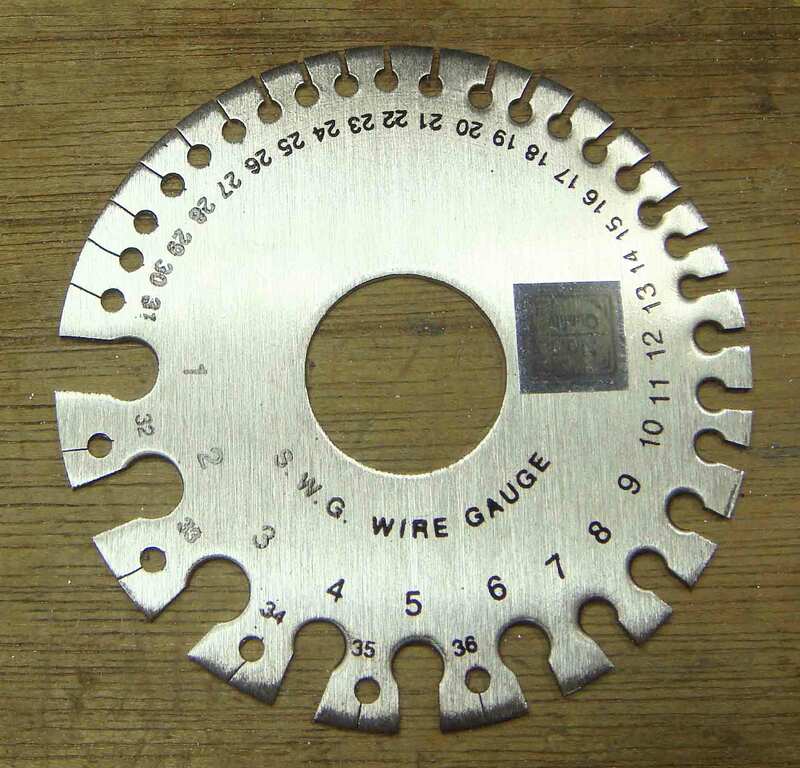 Though the tool pictured above is called a wire gauge (or gage), it is also used to measure the thickness of sheet metal. For a metal disc with holes in it, its price ($30-$50) can be a bit surprising to those new to the jewelry field. What you are paying for is a modicum of precision. If you work with wire a lot (chain makers, take note), this tool is a shortcut handy enough to be worth spending the money on. Let me explain why. If you have random hanks of wire or hunks of sheet metal lying about the place, you need a way to determine what size they are. You can use a a caliper, micrometer, or brass sliding gauge to measure them in millimeters or inches, and then you can use a chart to look up the corresponding gauge number, or you can go straight to a wire gauge. 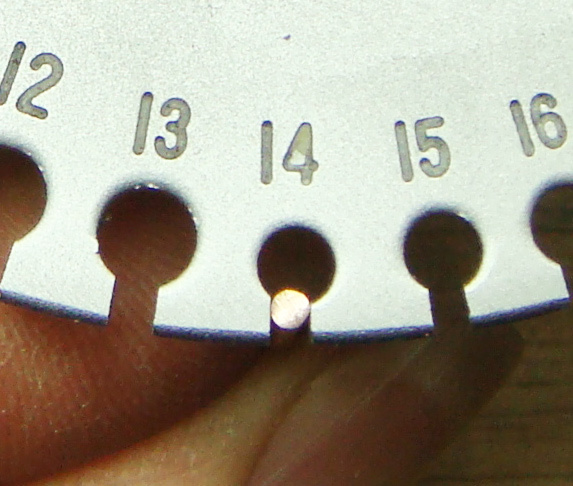 In the USA, wire and sheet are routinely sold by gauge. Even our commonwealth neighbor, Canada (which generally sports the sensible metric system) harbors many wire suppliers that list their wares in gauges. Jewelry making books and magazines published in the USA also regularly refer to wire and sheet by gauge. The somewhat myopic assumption is that we are all talking about the same thing, which is not always the case, but I’ll get to that in a minute. First, let’s talk about how to use a wire gauge correctly. You will be forgiven for thinking that since wire is round, the holes in the gauge are the important parts. Forgiven, yes, but also completely and utterly wrong. It’s the SLOTS that are important, which makes sense, really, when you think about it, since only the SLOTS will tell you if the diameter of a wire and the thickness of a sheet are the same. You want to find the SLOT that is closest to the thickness of your metal. Sometimes that means the metal fits snugly, and sometimes it means it just barely won’t go in. What you DON’T want is for it to be all loose and wobbly. If that’s the case, then the correct slot is the next smaller one. If you can wobble the metal in the slot, it’s not the slot for you! The RIGHT slot is a snug fit. Another view of the right fit. Try clicking on the image (so that it opens a bigger version in a new window), and then it should be really obvious that I have lined up the AWG (American Wire Gauge) 14 slot with the SWG (Standard Wire Gauge) 16 slot – and they are … drum roll please…. the SAME! What this means is that if you buy 16 ga wire from a supplier who sells SWG wire (like many suppliers in Canada), that wire will be the same as 14 ga wire in the USA (which uses American Wire Gauge). I have Canadian students who discovered this fact the hard way when – after taking a chain making class with me – they bought “16 ga” rings in Canada and couldn’t make a chain pattern that was sized for 16 ga in AWG. As if having multiple wire gauge systems weren’t confusing enough, inches and millimeters have to get in on the act and muddy the waters further, because on the backs of these gauges are readings in one of these more generally recognized linear scales. For AWG the Americans have, predictably, used fractions of inches on the B side. For SWG the B side is metric, in keeping with the system so sensibly adopted by commonwealth countries. Here’s a picture of the AWG gauge with the wire in the 14ga slot and an inset image of the wire in the same slot from the B side (.064″). The blue text is the readings from the AWG, and the red text is the corresponding readings from the two sides of an SWG gauge. 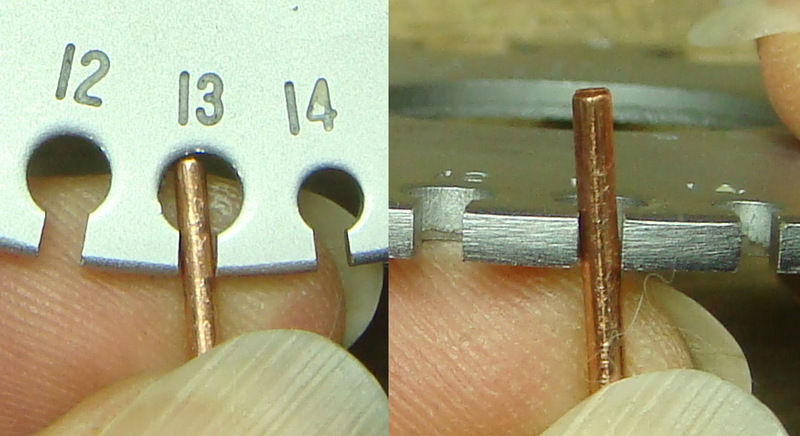 Here’s the corresponding image of the SWG gauge with the SAME wire in the 16ga slot and an inset image of the wire seen from the B side (1.63mm). Red is SWG. Blue is AWG. Right. So the important thing to remember here is that whenever you see “gauge” listed somewhere in reference to the size of something, you need to ask yourself what gauge system is being referred to, and if that’s the SAME system as the one you habitually use. Otherwise, chaos may ensue. Fortunately there is a wonderful resource available online to help cut through the confusion and make sense of all these numbers. 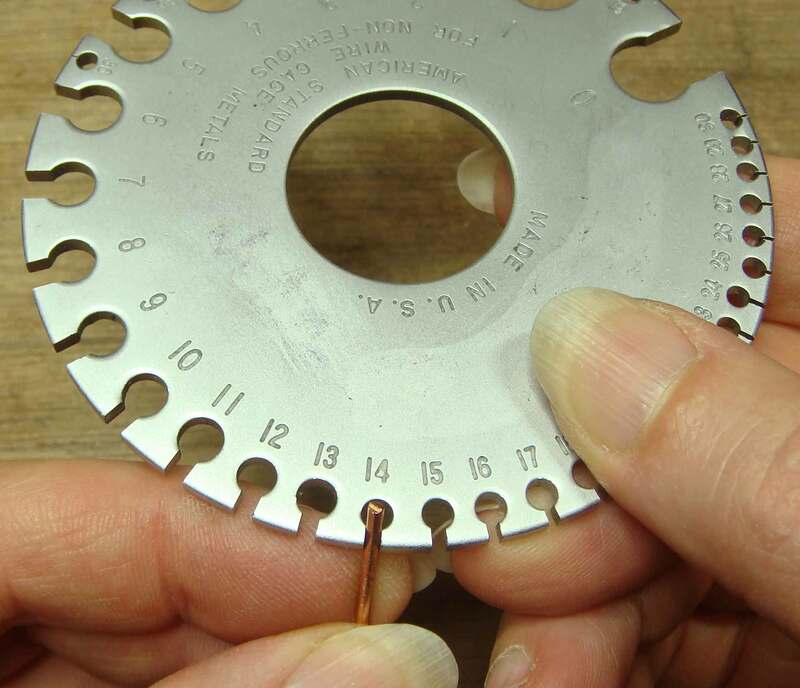 A British electrical engineer named Dave Cushman put together an INCREDIBLY useful chart of various wire gauges, diameters in mm and inches, drill sizes, and even cross sectional areas. I discovered his “Wire Gauge Comparison Chart” back in the late 90’s, shortly after I began making chain jewelry. I printed out several copies of the chart, and have consulted it frequently ever since. I urge you to consider following my august example :)! P.S. Why, you ask, do the smaller diameters of wire have the larger numbers? Basically, it’s because the number of the wire equates roughly to the number of times it has been drawn through a draw plate to get it down to that size. Itty-bitty wires have to be drawn down a LOT! P.P.S. Did a friend forward this post to you? Did you stumble on it by accident? Want to eliminate the element of chance? Click here to get on my direct list. This entry was posted in Get the Most from Your Tools and tagged AWG, gage, gauge, measure, sheet, SWG, wire. Bookmark the permalink. Thanks, Sue! You da bomb 2 :). Wire gauge should be made abundantly clear in any publication with instructions. And I mean weather it is AWG or SWG. I teach some wire and chain maill and get students having trouble making a weave from instrctions found in magazines, that are not clear what gauge is being required. Thanks for your post and info. “Wire gauges” are really a staple of any studio! Hi Carol, I SOOO agree! I frequently recommend Irene From Petersen’s book _Great Wire Jewelry_ and in the very same breath warn that she’s Dannish and so her wire gauge is probably SWG. I say “probably” because she never says what it is in the book, and even with multiple data points and Dave Cushman’s chart, I can’t say for sure if it’s SWG or some other unknown system! Fortunately, she gives mm approximations for the wire she uses, so Dave Cushman’s amazing chart will help you figure out what that translates to for the wire you have available. Great article! I’ve become pretty good at eyeballing gauges, but the odd ones (ie 21g, which I buy for ear wires) give me trouble. This would eliminate the guess work! Yes! So true! Also much quicker than using a micrometer, or other sliding type measuring device :). Definitely buy a good quality gauge. There are inexpensive ones out there that are not worth the money. For starters, the gauge should be pretty thick, too thick to bend easily, since a bent gauge will no longer be an accurate gauge. AWG is not arbitrary . These tools were developed for the wire industry and have a very important relationship between gauge numbers in regards to wire drawing. Each gauge number is approximately 20% smaller or greater in cross section surface area than the previous number. Four gauge numbers is a 50% reduction in surface area for example 16g a AWG has a cross section of 1.31 mm sq 19 gauge has a cross section of 0.653 mm sq or 49.8% smaller in area. This allows you to figure out how much cold work you have in a piece of wire so you know when to anneal without having to do a bunch of math. 14 gauge NON-ferrous = .064″ = (approx) 0.0625″ = 16 gauge FERROUS. So it’s important to note whether your gauge was designed to measure ferrous or non-ferrous metals. Here’s what I’ve discovered: Both AWG and SWG gauges are commonly used in the US, but for different applications. Apparently the AWG gauge (commonly used by US jewelers and others who work in non-ferrous metals) was originally designed to measure copper wire for electrical applications, and is still used for that purpose. The SWG gauge is used in industry and more generally with ferrous metals. It appears that outside the US, non-ferrous metals are not typically measured by gauge, but by thickness, so AWG gauges aren’t needed. When ordering from non-jewelry suppliers (as I often do for copper, brass, aluminum, etc. ), I’m now careful to ask for the actual thickness (in inches or mm) in addition to the gauge, thus avoiding confusion. Julie, the SWG gauge I used came from a jewelry supply shop in Canada. You are right that there is a great divide between ferrous and non-ferrous here in the USA.